Last time I wrote about my weight lost I had just dropped below 85 kg (84.2 kg) and I estimated that I would drop below 80 kg early 2015, well, things didn’t go that way. Not to say that it went the other way but things took longer than planned. We had Christmas which didn’t help much, then a nice weekend trip to Budapest (Was awesome), later a weeks family vacation (Was even more awesome) but most of all, I had several “Not low carb days”. After last weeks vacation where I gained 1.3 kg I’m back on low carb. Interesting was that while we went on vacation I didn’t care much about what I had to eat, so some pasta, bread, cake, candy and more of it all again. Most days I also had 1-2 beers, so that I only gained 1.3 kg was a bit of a surprised, I had expected it would have been 2-4 kg. The first few days after vacation I was still having pizza and chocolate but then I dropped down in weight again (low carb FTW), so now I’m actually a bit below the weight I had before vacation. 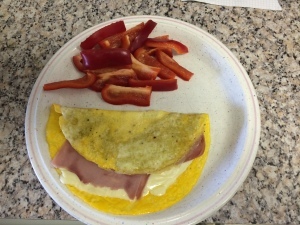 For breakfast I had a simple omelet, just 2 eggs, cheese, ham and some sweet pepper. Simple and good. For lunch I had what I very often have at work. 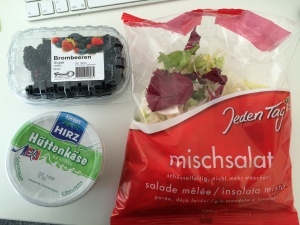 Some premade salad, sometimes I have some cheese with it but today I decided for cottage cheese and some blackberries for desert. For dinner I did a mix of spinach, cauliflower, sweet pepper and Shirataki Noodles and some meat. I remember when I first tried the noodles, how much I disliked them but guess my taste is changing slowly. All very low carb so the day was about to become a < 50 gram of carb when I decided for a snack… Something I been looking for, for some days, green Snickers (Hey, it is green, so must be healthy). Found them today and bought a couple of them. Also had a protein drink (mixed with water) and 12 grams of 100% cocoa chocolate. I have the Spartan Race in München on the 18th of April (so just in 6 weeks), until then the goal is to be below 80 kg. The less kg to run around with the easier the race will be (At least in Theory). I recently had a small accident at the gym where I fell down and twisted my knee, imagine if I haven’t lost the 13 kg, then it could have turned out way worse. But as a friend said, had I not lost the 13 kg then I would probably not have been doing the crazy things I tried.. 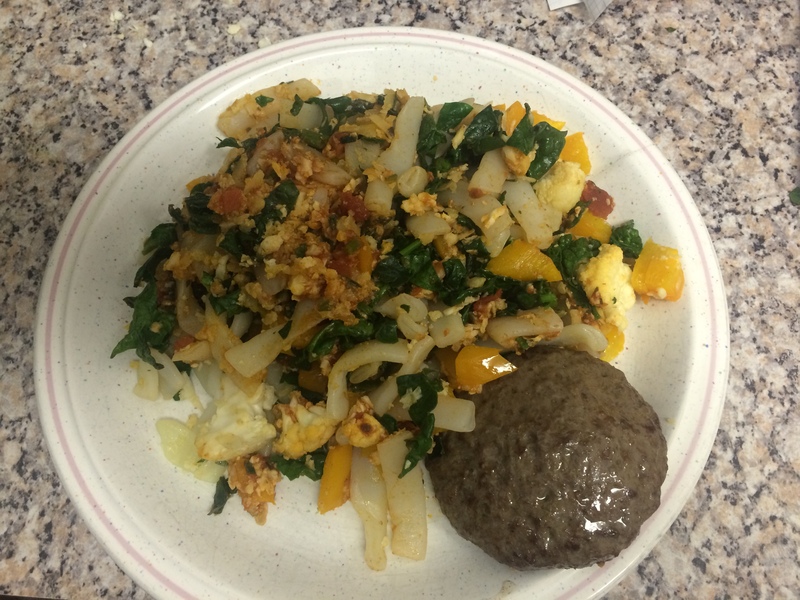 The plan will be to continue with low carb (Without all the snacks) and increase fitness in the weeks up to the race. Sure the knee injury didn’t help but things are progressing nicely. Still feel the pain when I walk down stairs or if I sit wrong. I’m also avoiding exercises that involves squat & running. So no burpees for me for now :-( The worst part about the injury was the mental setback, from been able to do burpees and increasing the amount, been able to run longer and longer on the treadmill to sudden not been able to do any of these things but at the same time it fuelled the motivation and focus on improving. My weight watchers leader always recommended a “controlled gain” or a “planned gain” while on holiday. So when you come back you can hit the ground running. Sounds like you did that.